I can hear you now: "Where the hell is Cedaredge?" Cedaredge is on the western slope at the foot of the Grand Mesa, near the town of Delta, and about an hour from Grand Junction. It's a rather large town for not having a single stop light, but it does have one of the best guitar stores I've ever seen. Starr's Guitars is worth the trip alone. Cedaredge is also known for its apples. I had some wonderful cider while there and hope to get back next fall for AppleFest. The best thing about my trip to Cedaredge was the wonderful friends I made there. Ann Knutson was a fantastic MC and the reason I was asked to play in Cedaredge in the first place. She's done quite a job as a one-woman street team! It was an absolute delight getting to know my hosts for the weekend, Shari and Ralph Owens who own the historic Lovett House Bed & Breakfast. It was like getting to know family I didn't know I had. Shari's cousin John came up from Denver for the show and he was great fun to hang out with. It's strange to have made a new friend who lives in your area at a place so far from home. We had the pleasure of meeting Roy Martin, a fine singer-songwriter/guitarist who opened for me, and his lovely wife Dea. They gave us a tour of their off-the-grid home, an Earthship! I've been interested in Earthships for years, but never saw one in person. Roy and Dea are in the process of adding another room on to their property so we got to see both the finished product and a work in progress. If you're into green building, you simply must check out this design concept which utilizes used tires and adobe-style mud to create unique, earth-friendly homes. It's always amazing and humbling when I play a show in a town I've never even been to before and a bunch of people show up to hear me. What a gift! It's really a joy to be able to share my music with new folks and the reception in Cedaredge was just overwhelming. I was also able to give back to the community since the show was a benefit for the Cedaredge Chamber of Commerce. It was a win-win all around. I'm so grateful to Ann and Shari for all their hard work organizing and promoting the show, to David Starr at Starr's Guitars for selling tickets, and to Jim and Candy Barber in Lakewood who started all this by turning Ann on to my music. It's surreal to think that the simple gift of a CD can generate so many wonderful relationships and experiences. Shari did such a great job of promoting the show I don't think I went in one single shop that didn't have a poster with my mug on it. 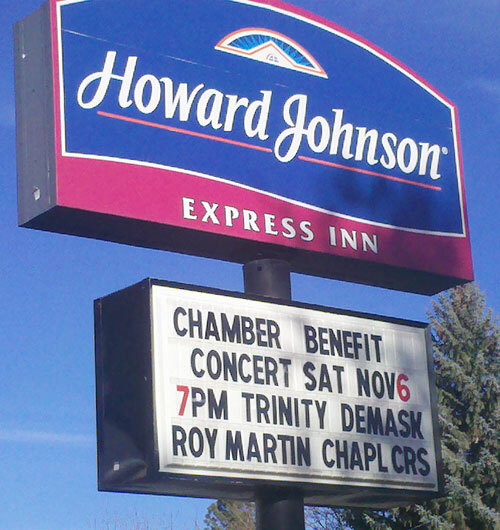 She even arranged to have the concert promoted on the Howard Johnson's sign (the show was NOT at HoJo, it was at the Chapel of the Cross in the Pioneer Museum). 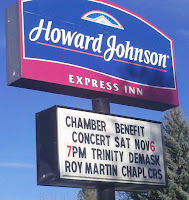 How often can you drive through a town for the first time and see you name on the HoJo marquee? Priceless!